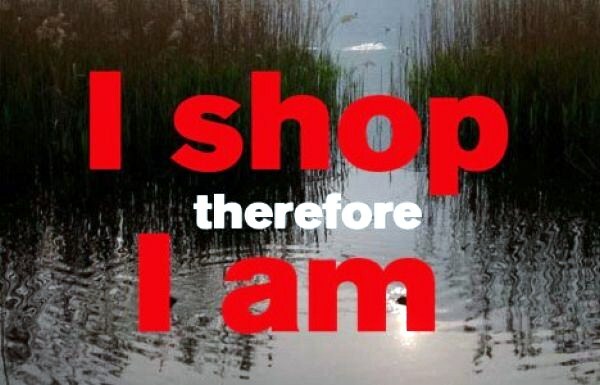 If the dominance of consumerism has been severely criticised, it is perhaps because consumption cannot be justified without need. Aside from its environmental issues, consumerism condemns us as mere robots, easily manipulated by advertisements on what we truly need. Shopping is, therefore, a secular sin, that fools us into thinking we need an excessive amount of ornaments and decorative items to exemplify our self-indulgence, a manifestation of what we want rather then what we need. It encourages temporary satisfactions. However, to be fully human, the anti-consumerist maintains, is to only buy what we need. Why would one need an expensive cardigan when a cheap one can equally serve the exact same function? Why should we follow the trend when we can have our own styles? After all, we all, in essence, should long to be admired for logically irreducible elements: intelligence, excellence, integrity, compassion etc. No matter how chic we can get, death will still come and haunt us, threatening to turn our worldly possessions into ashes and dust. Whatever arguments may be brought up against shopping without need, should we not allow shopping a part of our guilty pleasure in the private sphere of our heart? If shopping has to be subject to rational scrutinisation, one may perhaps find its root in our rampant pecuniary culture, however, rather than accusing our economic system of the capitalistic formation of unnecessary desires, perhaps magazines are largely to blame. If magazines take up their part in triggering our commercial minds, it is because magazines have to make us unhappy. Flipping over pages of lifestyle magazines, how an ordinary unaided mind might be able to resist the seduction of the satanic genius of the editors. Though a great many magazines on the surface may offer solution to the human conditions, though they may help us to discover ways to materially manifest certain good ideas of life, it only leaves us miserable in the end. In the clothes section, it reminds us of how many new garments have to be compensated for our wardrobes. In the decor section, it informs that our homes probably have no style. Lastly, in the cleansing, cosmetic products and perfume section, it enforces a message that we are far from being able to keep our skins in good conditions and may lead us to lose temper over a flask of limited edition perfume. Therefore, magazines are not mere the gospels of what a good life means, but rather, they are instruments of psychoanalysis. Because the fact that they leave us miserable is only a reminder that we should suffer aesthetic analysis. Learning how many clothes are missing in our wardrobes and how many decorative items are missing in our homes attend to us the idea that perhaps our tastes have to be refined or even unlearnt and that our sense of fashion has to be sharpened in order to love life. These magazines invoke in us a succession of questions: why don't I have this particular handbag to harmonise my Anna Sui's cosmetic sets? Why am I unable to wear long loose shirts correctly over leggings? How can I neglect purple is the colour of this summer? Why am I ignorant of certain cleansing product that may neutralise the dermatological disaster on my face? Little wonder why our tastes deserve scrutiny. However much pain these magazines have inflicted on us, looking over images of a world of perfect beings, we are still stripped of defences. We still find pleasure in contemplating pages of unhappiness in our beds alone and devising a detailed shopping list to make sure that we follow the "correct" social logic of tastes and styles. All this, unfortunately, is an illusion. The editors of these magazines have successfully fooled us into thinking we are actually the models ourselves, that once we put the clothes on, we will be under the illusion of possessing the stylishly posed figures who are modelling the summer collection and being photographed under big spot lights. Only until we return home, we will realise our lack of physical candour and therefore are liable to avoid the verdict of a full-length mirror. We mistakenly confuse the mirror with the lens skilfully placed in the sophisticated design of a camera and overestimate our own ability to see through the photographer's eyes. The problem of these magazines inevitably leads to the problem of shopping. Shopping invites us to cast aside our reasoning abilities and favour a trust in mindless consumption. However, to condemn shopping is to fail to ascribe to shopping a proper value in our psychological make-up. Shopping is not just about buying what we need, but rather, it reflects a deep question of who we are, a question that might provoke us to search for the answer for a lifetime. The reason why we always shop for what we want instead of what we need is that we are often unsure who we are or what we want to become. Confused, we are then liable to adopt the suggestions made in magazines that provide a justifiable defence for our shopping rituals. Our search for a decent camera, a pair of jeans, a Hermes handbag, or a pair of Martin Margeila's represents a process of soul-searching. Since we are unsure who we actually are, then we might as well figure that out by fitting in the current trend through the workings of shopping, anchoring ourselves to a more socially recognisable forms. It is also precisely because trends and styles endlessly fluctuate that allows us to abandon identities that may not inherently belong to our selves. Shopping, like science, is piecemeal. It leaves open for the possibility that we are susceptible to change and therefore open to revisions when necessary. It conspires to test itself against mental evidence. Which means our tendency to switch styles may suggest that our identities are always subject to change due to accumulation of new experience. While we often deprecate the consumerist ethics, we ought not to neglect the unmentionable gravity of shopping in our philosophy of life. So rather than just buying what we need, we might as well buy what we want as long as it is financially affordable. Because shopping is not merely about consumption, but rather, it is a means to self-understanding. It allows us to see through the shop windows to a more enchanted world, a part of us that lies beneath our skin that remains undiscovered until a considerable amount of money is chiseled in our bank accounts. Shopping is no trivial task.